Dry Treat Hanafinn Sola-Kleena is an innovative self-cleaning photo-active (light activated) cleaner for hard porous surfaces. It works particularly well on lighter colored materials such as concrete. You simply apply it and let it do all the work. 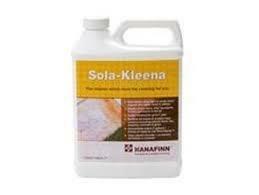 A light coat of Sola-Kleena™ breaks down organic dirt and grime and other pollutants, cleaning the surface over weeks. Sola-Kleena™ will keep working on the treated surface often for years. Sola-Kleena™ is suitable for use on outdoor, and residential / commercial applications on patios, decks, floors, building facades, walls, cladding, public spaces, swimming pool surrounds, garages, driveways, eating and entertaining areas. Typical application: Sola-Kleena™ is an innovative self-cleaning photo-active (light activated) cleaner for outdoors hard porous surfaces. You simply apply it and let it do all the work. A light coat of Sola-Kleena™ breaks down organic dirt and grime and other pollutants, cleaning the surface over weeks. It is safe for use on natural stone, tile, masonry, concrete and grout. Benefits: Self-cleans using the energy in sunlight and moisture in the air to break down organic dirt, algae, mold and mildew. Breaks down odors, VOC emissions and other pollutants in the air. Keeps working for years. Suitable for indoor and outdoor hard porous surfaces including natural stone, tile, masonry, concrete and grout. Uses natural minerals – no harmful chemicals or residues. Application rate: Sola-Kleena™ is supplied as a concentrate and is diluted with fresh water to make the ready-to-use cleaner. One quart (946 mL) of Sola-Kleena is mixed with 4 quarts (4 Litres) of water to make 5 quarts (5 Litres) of ready-to-use cleaner. This is enough to treat an area of up to 800 sq.ft. (80 sq.m. ), depending on surface conditions. Do not apply over varnishes, paints or other coatings. Heavily soiled surfaces, should first be deep cleaned with HANAFINN Oxy-Klenza™, then treated with Sola-Kleena™ to keep it clean. Dilute Sola-Kleena™ - one 8 fl.oz. cup (250 mL) per 2 quarts (2 Litres) of fresh water. Mix well and use a low pressure pump spray and apply a light coat of the solution evenly to the surface. When diluted, application rate is 1 quart per 100 sq.ft. (1 Litre per 10 sq.m. ), depending on surface conditions. Over-applying can leave a white residue. Wipe up or rinse with water any excess before the solution dries. Product takes approximately 1 week to become photo-active and keeps on cleaning the surface over time. Typical time between re-applications is often years, depending on surface conditions. For heavily soiled surfaces, it is recommended to first deep clean the surface with HANAFINN Oxy-Klenza™ - then treat with Sola-Kleena™ to maintain it. Sola-Kleena™ has zero VOC's and qualifies for LEED 2009 IEQ Credit 3.3: Green Cleaning - Purchase of Sub-stainable Cleaning Products and Materials 1 Point. May fade or lighten the color of some surfaces. Avoid moisture contact with the surface for four hours after application. Wear suitable rubber gloves and safety goggles during application. Wash hands thoroughly after removing your gloves and safety clothing. Pack size: 1 quart (946 mL) concentrate plastic container. When diluted with water this enough to treat up an area of up to 800 sq.ft. (80 sq.m. ).